Little is known about William Dingwall. 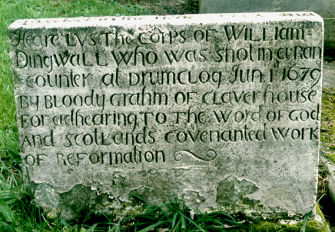 He was born in Fife and took part in the Battle of Drumclog, where he was mortally wounded, dying soon after. His dying testimony was subsequently published. The small headstone to Dingwall was originally erected in 1732 and was renewed in 1833.